I want to get information of my flipbook visits, how can I collect data for analytics? You can add Google analytics tracking code to your flipbook with FlipBuilder flip software such as Flip PDF . Google Analytics is one of the most useful and popular analytical tools for site owners, not only because it's free, but also for its powerful features and function. This powerful tool helps you collect different kinds of data and info, from page visits to sales and conversions, from social share to advertising performance. And what's more, with the data collected, Google Analytics not only helps you to measure your achievement, but also gives you fresh insights into future strategy. Now you can make full use of Google Analytics to collect statistics of your flipbook created by Flip PDF. 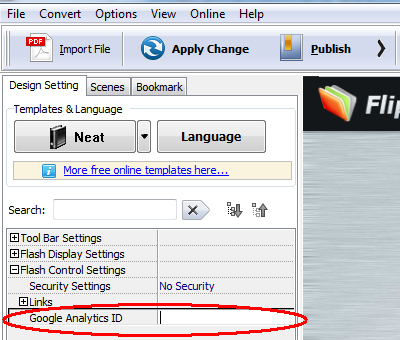 And below are the steps on how to add Google Analytics tracking code to the flipbook on your site. 1 Build a website in the Google Analytics and get the tracking ID. 2 Add the tracking ID to the flipbook in the design setting and upload the flipbook online. You can upload the flipbook to Flip Builder server or your own server. 3 Change the website of the Google Analytics to the book URL and then you can see the collected data. And once you upload your flipbook to your website, you can login your Google Analytics account and you can track the visit data of your flipbook, including page visits (of each page), link clicks, video play times, audio play times and so on. This method is not recommended because it can help you track only visitation of the book URL, which means you can only obtain statistics of Book Open times. To use Google Analytics, you will need to log in or sign up for a Google account. If you don't have one, just go to google.com to create a new Google account. Now log into your Google account and add Google Analytics to be a "Product" associated with your Google account. Input your new "Account Name", site URL(domain.com) and complete other settings you prefer. Here, you can either log in the exising Google account and add Google Analytics to your existing products, or log in the new Account to add Google Analytics as part of the process. And next, you will need to embed the unique Google Analytics code to collect data on that domain. 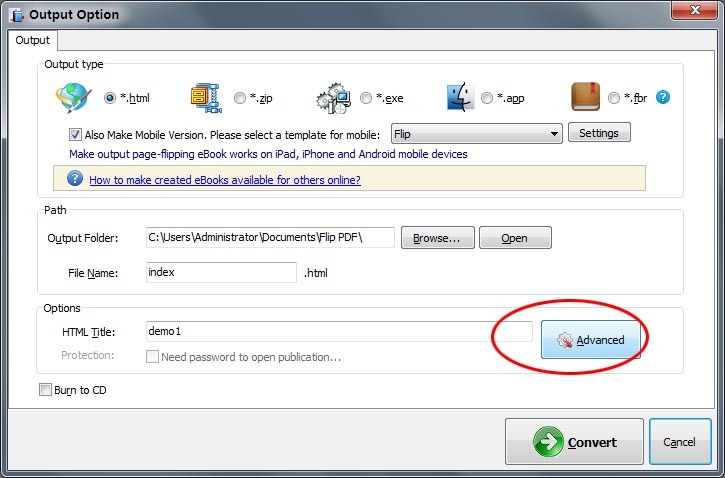 Launch Flip PDF and import PDF to create your flipbook, click the "Publish" button or the "Arrow" buton to choose "Flash/HTML5" to enter into the output interface. In the next screen, choose "*.html" and define other settings, and click the "Advanced" button. Now in the Advanced Settings window, insert the below Google Analytics code into the "Add Scripts" box and click OK to save the settings.